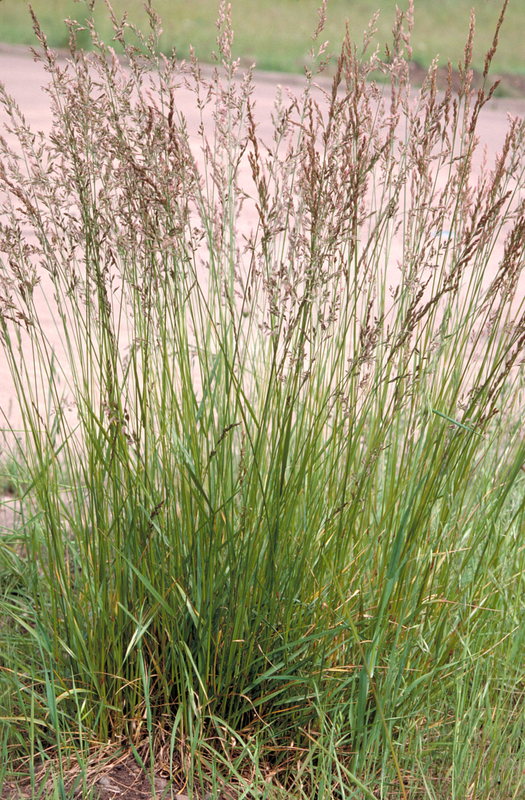 Festuca elatior. Billy E. Warrick Ph D. Uvalde Research and extention Center.Texas A&M University System.soilcropandmore.info (Accessed 5/2014). Schedonorus arundinaceus is a perennial C3 grass (Wand et al. 1999; Basinger 2002), coarse, tufted, flowering stems to 1.2 m tall; smooth, very tough, and firmly rooted (Gargiullo pers. obs. 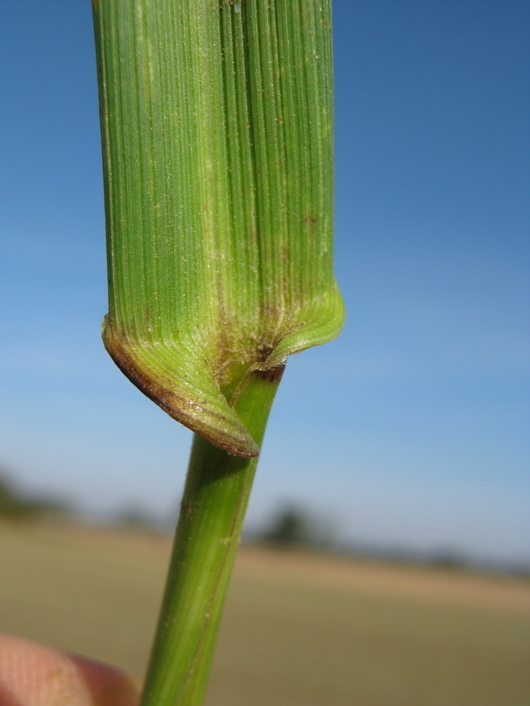 ), sometimes with short rhizomes; sheath free, overlapping, old sheaths pale; prominent leaf base lobes (auriculate) that wrap around stem, margin of lobes with short, bristly hairs (use lens). Leaves flat, dark green, shiny, coarse, thick, 10-60 cm long, 0.4-1 cm wide, smooth or slightly rough above, veins ridged, basal leaves often green well into winter, leaf bases near root crown whitish marked with purple, new shoots often purple near base (at least late in season). Schedonorus arundinaceus.florets.Nicola Ardenghi.Forum Acta Plantarum.actaplantarum.org (Accessed 2/2017). Flower spikelets 3-6 flowered, spikelet axis minutely toothed (scabrous), glumes narrow, unequal, shorter than spikelets, first 0.4-0.6 cm, second 0.5-0.9 cm, lemmas to 0.8 cm or more, with a short awn to 0.2 cm, often purplish with whitish margins giving spikelets a herring-bone pattern; inflorescence to 20 cm, narrow, basal node with 2-3 branches, branches bearing spikelets nearly to base; blooms and fruits May-Aug. Seeds eaten by birds and small rodents (Martin et al. 1951). Schedonorus arundinacea. 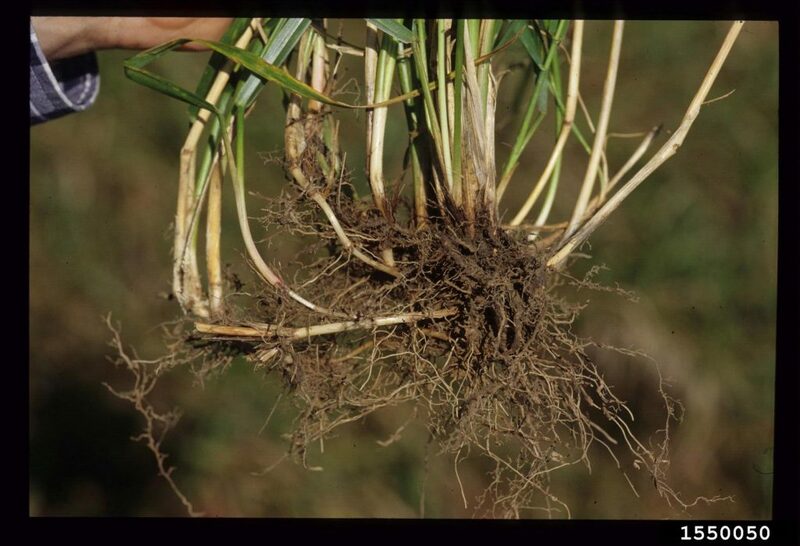 roots.Invasive Plant Atlas of the United States.Ohio State Weed Lab , The Ohio State University, Bugwood.org (Accessed 2/2017). Frequency in NYC: Occasional in natural areas. Probably more frequent along roadsides than indicated above. Habitat: Open areas, a lawn and pasture grass, used for roadsides, open fill, soil pH 5-9; tolerant of fire, moderately tolerant of salt, drought and shade (USDA, NRCS 2010). Schedonorus arundinaceus.auriculate leaf base.Nicola Ardenghi.Forum Acta Plantarum.actaplantarum.org (Accessed 2/2017). Notes: Foliage eaten by rabbits and some rodents (Martin et al. 1951). Turfgrass used in roadside mixes. 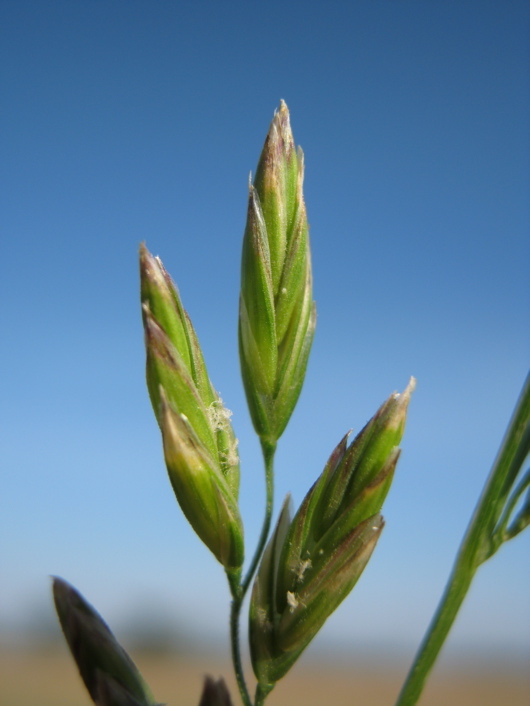 Plants usually infected by the endophytic fungus Acremonium coenophialum, that may help induce resistance to insect predators by promoting production of loline alkaloids (Boning and Bultman 1996). Dense cover may inhibit succession to woodland. (Gargiullo personal observation).